Entries closed. Vote on the winner in the sidebar till June 29th! This month's contest is going to be a fun one. Simply provide a caption for the picture above in the comments! The best caption may choose a hat or t-shirt from our Geek Twins store. You, the reader, submit your caption below, we choose three finalists, and you vote for your favorite using the "Like" button on the comments. Finalists for this month's contest will appear online Wednesday, June 22nd, and the winner will be announced June 27th. Only one answer per person is allowed, but you can also increase your chance of winning by promoting the contest using Twitter, Facebook or your blog. Just leave a separate comment for each entry. In the case of a tie, the winner will be chosen randomly. Any resident of the U.S. age eighteen or older can enter. We've got a lot of great stuff in our store from hats to t-shirts. You can pick anything you like under $20. At last count that's one of 13 items! What should the caption be? Let us know in the comments!
" 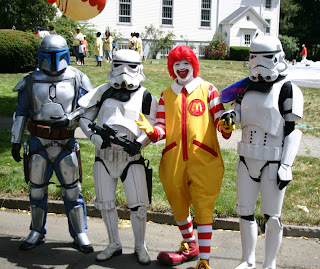 This isn't the 'roid we are looking for..."
We came to this planet to go to Burger King and we messed up. when did they make a 4th stooge? There's gotta be a clown in every group. "This is why Mommy won't let me go to Daddy's house anymore"
"I can't believe the dry-cleaners lost my Vader suit AGAIN...."